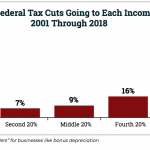 At a time when tens of millions of Americans are suffering from deprivation and poverty, the tax cuts rammed through by George W. Bush, extended in part by Barack Obama, and built upon by Trump “have mostly benefited those who are least in need of help. The board had a discussion of winter road conditions, causes of potholes, methods of repairing potholes, and specific reasons why Western Avenue has so many of them. The board considered a letter to state education officials asking to support the results of the vote against a school district merger, as it would negatively impact Brattleboro taxes. The Brewer’s Fest permit was approved, Brattleboro Words are being explored and celebrated, and a pile of tires near the Marina is a problem for plants and animals in the vicinity. 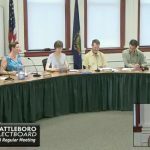 At their special meeting Tuesday night, the Brattleboro Selectboard finalized the FY19 budget. They agreed on the amount of fund balance to tap, set a final property tax rate, and reviewed draft warnings for Town Meeting on March 6 and Representative Town Meeting on March 24.